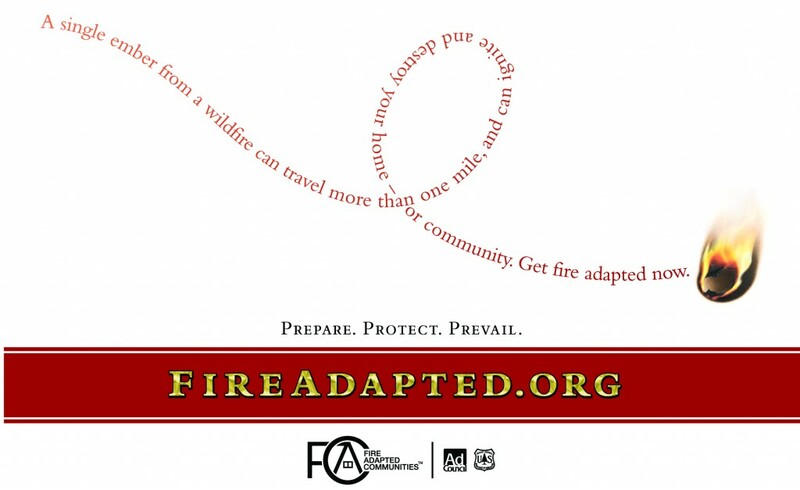 A Fire Adapted Community takes responsibility for its wildfire risk. Actions address resident safety, homes, neighborhoods, businesses and infrastructure, forests, parks, open spaces, and other community assets. The more actions a community takes, the more fire adapted it becomes. 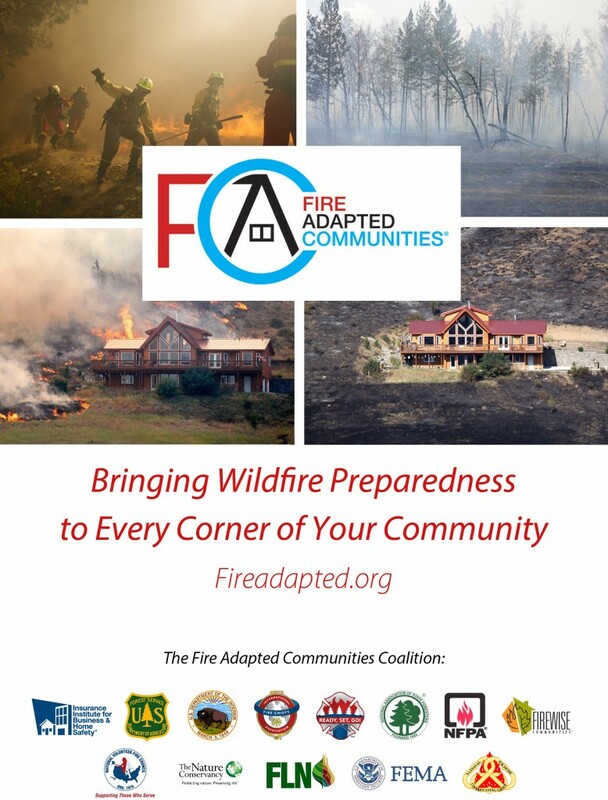 How does a community become fire adapted? It is in or near a fire adapted ecosystem. It has adequate local fire suppression capacity to meet most community protection needs. Its structures and landscaping are designed, constructed, retrofitted and maintained in a manner that is ignition resistant. It has local codes [building, planning, zoning, and fire prevention codes] that require ignition-resistant home design and building materials. Fuels on land near and inside the community are treated and maintained for safety. It has and uses a community wildfire protection plan. It has built other safety features such as buffers between fuels and the community; safe designated evacuation routes; and safe zones in the community when evacuation is not advisable. Residents and the neighborhoods they live in are linked by their wildfire risk. If one home is inadequately prepared, the risk level to the entire neighborhood increases. 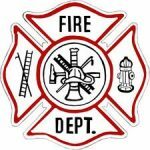 Everyone’s safety is impacted, including firefighters and emergency responders. 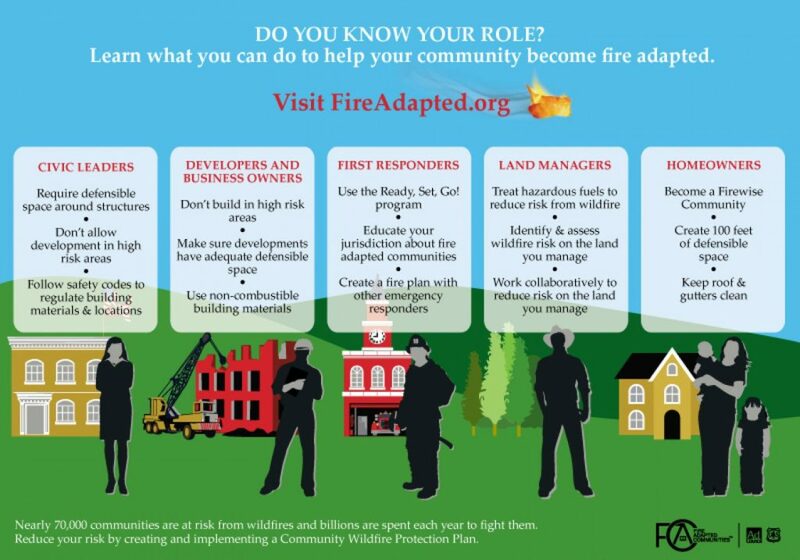 Work with your neighbors and the local fire department to make your neighborhood more fire adapted. Firefighters are available to come to your home or property and perform a FREE defensible space site assessment, make recommendations, and help you prioritize your list of fire mitigation measures. Don’t get caught without a plan! First, talk to your neighbors about becoming a Firewise Community. The Firewise Communities/USA® Recognition Program provides a series of steps to prepare homes and neighborhoods in advance of a wildfire. Firewise helps to direct community efforts and identify common goals. There are over 700 recognized communities in nearly all of the 50 states. Make yours the next one! Second, make sure you have an emergency preparedness plan. Know what to do and where to go before poor visibility, smoke, and flames cause panic and confusion. Ask your local fire department about how the national Ready, Set, Go! Program can help you and your neighborhood work with the fire department to plan ahead: create an emergency kit, build situational awareness when a fire threatens, and get your property ready with Firewise principles. Responsibilities come with owning land! You may have many questions such as: How can I reduce the risk of wildfire? How and when do I plant trees? Can I enhance the wildlife habitat on my property? How can I make my forest healthier? The Colorado State Forest Service can provide assistance in managing your land and answering these questions.